Yep, something different from me! Interesting painting this small again. Done with pastels and watercolour pencils. 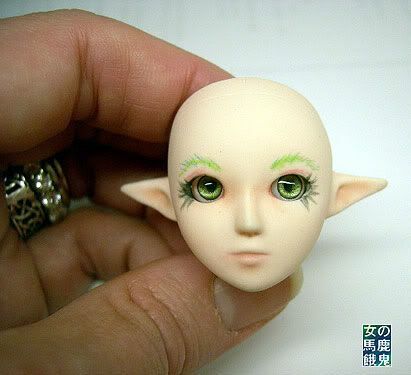 Definitely different face than the little Volks I did so many years ago. Had to cut out the neck and notch the eye sockets so the eyes would fit. The head with faceup... and my hand for scale. 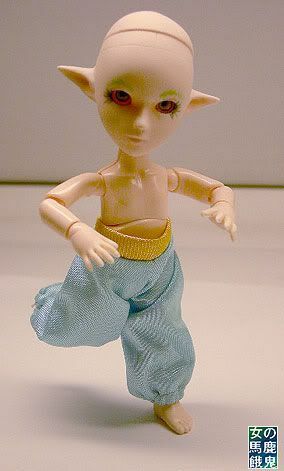 Don't know the gender yet but the pants make me think jinn. Green wig order just placed. Wow, that's teeny tiny! ♥ the way the everything came out. Yes, it's a tiny one. It has two more sets of hands. I think I will need to get a few more to play with. And maybe do some Gravitation ones since they're so inexpensive. Tiny Bad Luck would be a lark. That much cute can't be legal.... or safe! Hmm. Sounds like you're tempted. Four of us here in DFW have them now. They make great pocket dolls! The pants are from a McDonald's doll, I think. I purchase Kelly clothes and Kelly doll bundles on eBay and get lots of stuff in them. 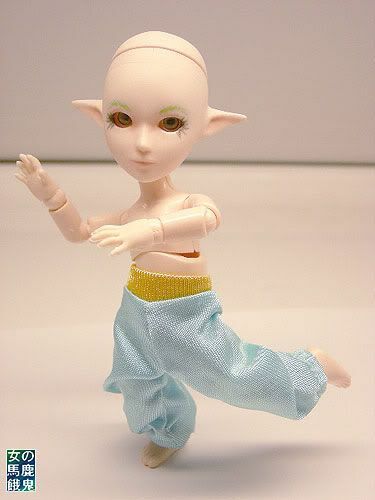 These pants are from one of those bundles and are too long for Pukis but perfect for this 11cm Obitsu. Lime green wig on the way!